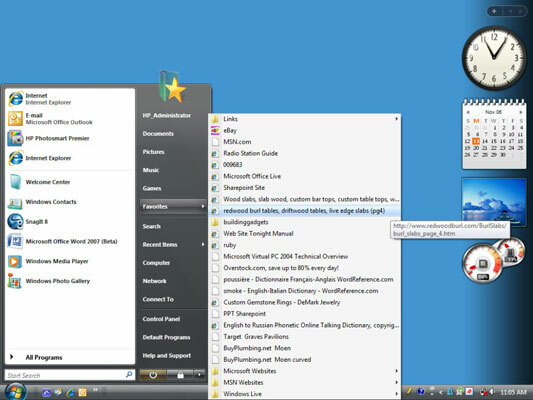 You can quickly and simply add a file to your Favorites list in Windows Vista. Most people think of the favorites list as simply Internet links, but you can also add a link to your favorite files, folders, and applications so that you can access them without having to work your way through Windows Explorer. Locate the files or folders that you want to make a Favorite. 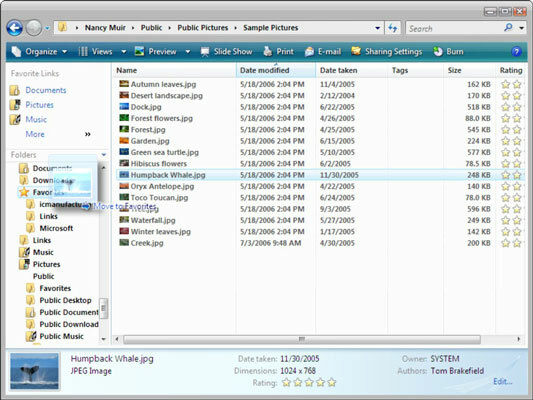 This involves navigating through your folder structure to find the files you want. Click the file or folder and drag it to the Favorites folder in the Folders list on the left. The Favorites folder in Windows Explorer. Use the scroll bar in the Folders list to locate the Favorites folder (which is typically located under you username folder). The shortcut to your file or folder should now be in place and ready for your quick access. To test out the link, locate your new link in the Favorites folder. Choose Start→Favorites to open the Favorites Menu. Scroll through the items in the Favorites list to locate the new item. Click once to open your favorite file or folder. The Favorites submenu in the Windows Start menu. If the Favorites item doesn’t display on your Start menu, right-click the Start menu and choose Properties. On the Start Menu tab with Start Menu selected, click the Customize button. Make sure that Favorites Menu is selected, and then click OK twice to save the setting.